Masami Aihara knows more about fingernails and manicures than probably anyone on Okinawa. The talented owner of Nail Salon Pass Tone has twice won awards at the Nail Olympics in London. 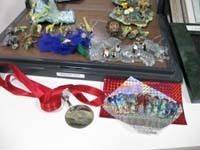 In both 2005 and 2007, Aihara--who’s owned the Okinawa City salon since 1999—took top honors in the fantasy art section, winning over more than 1,000 competitors. 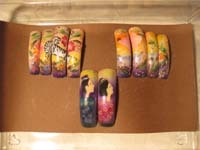 Her artistic talents have led to certification as an approved nail instructor of the American nail maker FPO, and holds a AAA license from the International Nail Association. For Okinawa, that translates to the highest quality manicures and nail art possible, with originality making the fingernails memorable. In the most recent flurry of excitement, five of Pass Ton’s staff have joined in competition for top artist honors in an event being adjudicated by the boss herself, Masami Aihara. Located on Route 24 at 2-15-2 Minamitohbaru in Okinawa City, Nail Salon Pass Tone is offering manicures for ¥2,625 and pedicures for only ¥3,500. Full sets are available for ¥6,000, with fill in work done for ¥3,500. Pass Tone is open Monday through Saturday, 9 a.m. to 7 p.m. Parking is available at the shop. An English menu is available, and the nail salon accepts only Japanese yen. A copy of the Pass Tone advertisement in Japan Update results in a 20% discount when presented to the cashier. Nail Salon Pass Tone is easy to find, being only ten minutes from Jyagaru intersection on Route 58 near Camp Foster. At the intersection, turn toward Route 24, heading uphill. Once past the zigzag slopes look for the pink sign board on the right, just across from Chatan Junior High School. From Route 330 Yamazato intersection near Kadena Air Base, turn toward Route 24, and look for Pass Tone on the left near Kyuyo High School and Tohbaru Bus Station.